Thanks to digital printing options and lower costs, custom branded packaging is in reach of more businesses than ever. But with so many potential branding opportunities, which custom packaging material do you start with? Rather than developing an entire suite of branded packaging right out of the gate, you can start nice and easy with just one product. We suggest custom packing tape. All it takes is a couple strips of custom printed packing tape to seal your shipping box, and boom, that kraft corrugated box is branded brilliantly. Think about it, what online e-commerce giant ships customer orders in corrugated boxes and just a few strips of their branded water activated tape? Here’s all it takes to make good-looking and high-quality custom packing tape with The Packaging Company. Our packing tape comes in rolls that are typically a few hundred feet long. But that doesn’t mean you’ll have to design the entire length of it. Simply choose a pattern length, create a design as detailed or as sparse as you like, and it’ll be repeated across the entire roll. TPC Tip: Choose a pattern length according to the box size you’ll be using. Shorter patterns repeat your design more per roll, but longer patterns can let your design sprawl out and feel less cramped. If white tape isn’t your thing, you can take advantage of bleed (printing right to the edge) and flood your tape with a vibrant, rich background color. The entire CMYK spectrum is available to you, so let your branding (or the occasion) dictate your choice. You can also specify color by HEX code. TPC Tip: You can lessen the intensity of any color by reducing its opacity. Sometimes, iconography is all you need to deliver a message. Our stock artwork gallery is full of one-color silhouette imagery that can be resized, repositioned and used in any way you like. And just like choosing a background, you can change the artwork’s color and opacity. TPC Tip: Explore the placement controls to position the artwork exactly where you want it. Often, it’s your own artwork and imagery that tells your story best. 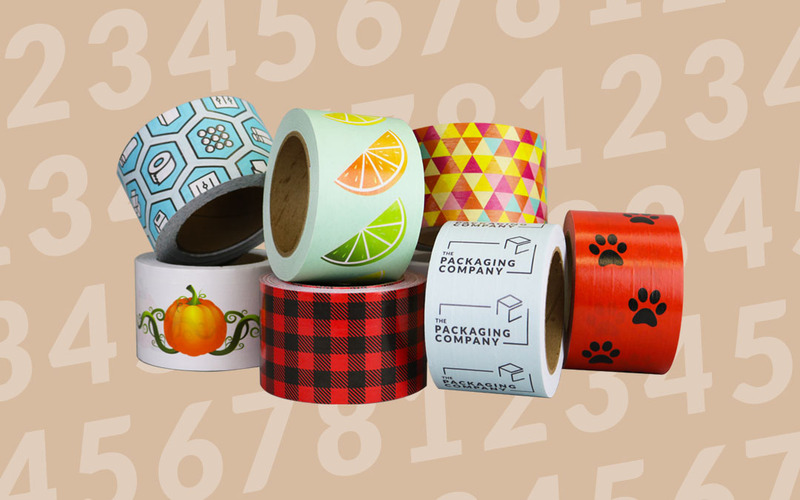 Use the Upload Artwork section to add anything you’d like to your custom packing tape design. An upload gallery will display any logos, photos or one-color silhouette artwork you add to it. TPC Tip: Take note of the blue lines on the custom tape designer. Anything above the top line or below the bottom line will be removed during printing and cutting. You can use this to your advantage, style-wise, by playing with interesting cropping techniques. Custom packing tape is a great opportunity to display your brand messaging. Use the Text function to add any wording you like, then adjust font, size, spacing, position, color and more using the included editing tools. Are there any fonts you’d like to see added? Let us know and we’ll check them out! TPC Tip: If you’ve got a pre-designed wordmark or a type treatment not possible with the text editor, use the Upload Artwork function to add it as a graphic. Don’t forget to make it hi-res! Every graphic you add to your custom packing tape becomes its own layer. Depending on your design intentions, you may want some elements to sit overtop (or below) others. Use the 4 lines icon to move the layers up and down until you create your desired look, use the padlock icon to lock an element in place (and unlock it should you want to move it), and the x button to delete any element you like. TPC Tip: Much like using the cut lines to play with interesting cropping, the layers function allows you to create interesting design hierarchies (or hide parts of certain elements you don’t like). Your custom tape’s almost ready for printing. Now all you’ve got to do is decide how many rolls of your branding masterpiece you want to print. You can start with just one roll to test the custom packaging waters, or order several to keep your packaging efforts going without interruption. TPC Tip: The more custom packing tape rolls you buy at once, the lower each roll’s price becomes. Ready? Click that big blue Add to Cart button! You’ll be taken to our checkout area, where you’ll fill out contact, shipping and payment information. Click the Place Order button and your tape is on its way to becoming a real printed product. We can’t wait to see what you’ve come up with! TPC Tip: If you know you’ll want to reorder this exact custom tape design again, click Save Design and login. It’s one extra step but it’ll save you plenty of time later. Custom branded packaging is a fantastic way to make your customer orders stand out. Using the custom tape designer from The Packaging Company, the vibrant, cost-effective custom packing tape you want is only 8 steps away. Have fun, and show us what you can do!